Want to save 5% on your next home improvement project? Want to help Rona to make a donation of up to 5% back to the Ottawa Humane Society? 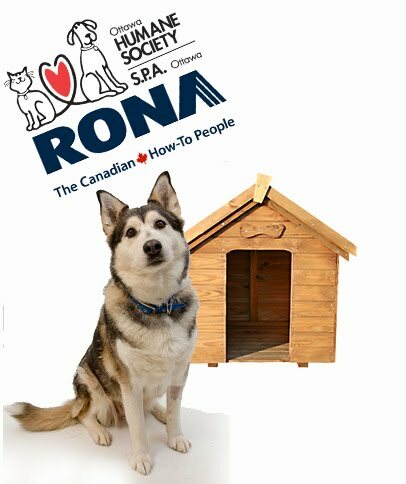 Head over to both Ottawa Rona locations and receive a discount card in support of the Ottawa Humane Society. Rona, a Canadian company, is partnering with several local charities for this pilot project, which will save you 5% on any purchase and in addition send a donation of up to 5% our way. You don’t have to pay a cent for the charity card – download one from our website, pick one up at the shelter or any of the two Rona stores and keep the card in your wallet for all future purchases! It’s a win-win all around! So if you’ve been meaning to install that fence in your backyard to help keep your canine companions in, now’s the time to do it! This promotion will save you about $100 on a $2,000 fence, and help make a donation back to the animals in our care. Rona is located at 585 West Hunt Club (just down the road from our new facility at 245 West Hunt Club) and at 1880 Innes Road.